Bertie: Now, you understand this is just a temporary setup, what? Bertie (narrating): He really was cute when asleep. It’s almost enough to make a confirmed bachelor reconsider his posish. on fatherhood. Almost. Walter (flashback): I do not advise wearing that scarf, Sir Integra. Young Integra: Really? I think it’s stylish. Walter: It is audacious, sir. 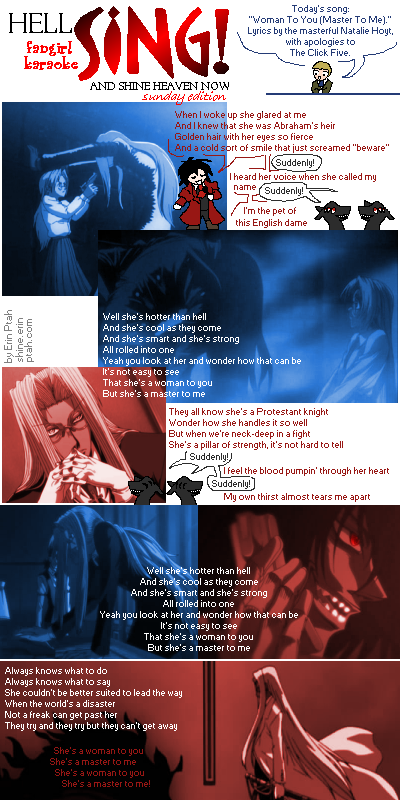 Alucard: Master? Are you listening? Integra: Hm? Yes. Just thinking some things make more sense now. Carry on. Narration: My name is Shoujocard. I’m normally an energetic girl who will always fight for the people who are precious to me. But my last master only saw me as a tool, and locked me up when I was no longer useful. Who is this handsome boy? Find out in the next issue of Shoujo Bite! Bertie: Just a moment, Jeeves. Has he anywhere to go? Jeeves: No, sir. That is the usual meaning of ‘homeless’, sir. Bertie: Well, er…I suppose there’s no need to shove him out on the street just yet, eh? Jeeves: Just as you say, sir. Bertie: Jeeves! Is this true? Jeeves: I’m afraid so, sir. This boy is homeless. He has no one to take care of him. I offered him clothing and a hot meal. I apologize for bringing him here without your permission. I’m afraid you will have to leave now. Jeeves (whispering): Don’t overdo it. No! The Wooster resolve will not be thwarted by a cute face. Tell me how you got in here, child! Mr. Jeeves let me in. Bertie: Now see here! You can’t just invade a man’s home and start smashing up his crockery! Gosh, mister…I’m real sorry about your plate. Please don’t get mad! Bertie: Not a word, old thing! the young master will see this for himself! …or is there a little ruffian in my kitchen? Jeeves: I’m afraid there is, sir. Today’s song: “Woman to You (Master to Me).” Lyrics by the masterful Natalie Hoyt, with apologies to The Click Five. They try and they try but they can’t get away…! She’s a master to me! Bertie: Yes, well, bit of a fuss down at the club. Thought I’d better biff off before the constables broke it up, what? Bertie: I say, Jeeves, what was that?